According to BiiSafe’s CEO, Jouni Suutarinen, the unsettled global situation and urbanisation will keep demand for security services stable. The mountain of used electronics is growing, with consumers buying new devices at an ever-increasing pace. BiiSafe Oy has devised a way to turn old smart phones into security devices that can be used, for example, in the home, at the cottage, or in a boat. The idea of giving new life to old mobile phones was born out of a need faced by BiiSafe’s CEO himself, Jouni Suutarinen, in conjunction with the release of a new iPhone. Suutarinen recalls holding in his hand his old, yet still completely functional, smart phone with a slightly cracked screen. — I ended up getting a new one, but at the same time, I thought about the fate of my old phone and about the many features of mobile phones in general, such as charger detectors, cameras, microphones, motion sensors, and WiFi and 3G connections, says Suutarinen, who has an extensive background in computer programming. And from there the idea took off, with the first prototype programs coded by Suutarinen himself. It quickly evolved into a diverse alarm and surveillance application. To use BiiSafe’s app, users must first download it from the AppStore or Android Play to two devices, such as an old mobile phone and a new tablet. The user must then create an account, which requires only an email address and a user ID. The data is registered automatically in the cloud. The old phone can be used, for example, as the monitoring device, and the new one for viewing. The monitoring device automatically takes pictures at the desired intervals and analyses the surrounding sounds. If a security alarm or fire alarm sounds, the device recognises it and forwards a message to the viewing device. The program is suitable for many locations, from homes to businesses. 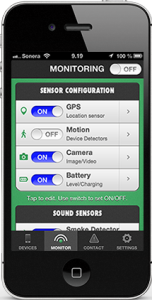 The user can monitor the situation at any time, say, while out jogging or while on holiday. The app can also be set to monitor, for example, power outages and to take pictures or videos remotely. Today’s mobile technology offers countless opportunities to develop monitoring devices and services. BiiSafe makes simultaneous use of old and new technology. — In future, we might see a shift towards a decreased volume of unnecessary electronic devices, as their use can be transformed to fulfil new purposes, Suutarinen envisions. — The iPad, for example, is already proof of how many uses one device can have. Wireless capabilities, voice control and cloud services are constantly opening up new opportunities. The navigational abilities of mobile phones, for example, have already made separate car GPS devices somewhat obsolete. There is major potential for BiiSafe’s app, as remote monitoring systems cover only some 10 per cent of homes in Europe, and in the U.S. the figure is somewhere around 20 per cent. Suutarinen reckons the unsettled global situation and urbanisation will keep demand for security services stable globally, at a growth rate of more than 5 per cent annually. 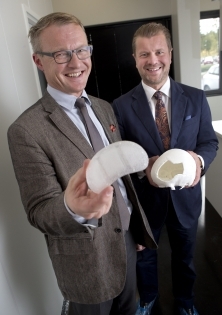 Lehtikuva/ Roni Lehti Skulle Implants owner and inventor Pekka Valittu (left) and CEO Tommi Brunila plan to test European markets first for their product. Finnish biotech company Skulle Implants, based in Turku in Finland, is bringing its skull implants to markets estimated to be worth billions of dollars. Skulle Implants CEO Tommi Brunila said to YLE, that the company is bringing its implants to markets in Europe in December. The company started production of implants earlier this year. They are made of glass-fiber reinforced bioactive composite, and can be used for correcting large skull bone defects due to trauma, tumors, infections and craniotomies. Pekka Valittu, the inventor and owner of Skulle Implants, said to Good News from Finland that patients have tolerated implants well. In her doctoral thesis, the University of Turku researcher Nganga Sara, found also that the antimicrobial coating used in implants had “an excellent short time antimicrobial effect.” — Our skull implants have been made from the materials and chemicals that are proven safe, and they have less infection risk than the traditional implants made of plastics, says Valittu. The company intends to sell implants first to hospitals. — We have done some premarketing of our implants. In a first phase we are planning to sell our products directly to hospitals, but we believe that our implants will be a success anyhow, said Brunila to YLE. Finnish intelligent flooring has already gained a strong foothold in the global markets. Safety solutions directed at senior citizens are experiencing growing demand as the population ages. The sector, which remains unswayed by economic cycles, has a bright future ahead of it. 9Solutions, an Oulu-based company offering safety and productivity solutions for the healthcare sector, was established in 2009 by the company’s CEO due to personal reasons. — I came up with the idea in 2008 when I became concerned about how my aging father, an independent farmer, was doing. Having a technical background, I started to think about how we could improve elderly people’s safety, says Sami Herrala. Herrala drew up a business plan, found himself some business partners and early-stage financiers and was already out presenting the system at a trade fair in Stockholm in September 2010. 9Solutions’ system is based on the positioning platform developed by the company, which uses Bluetooth and cloud technologies and which helps to track both people and devices, indoors and out. The solution rolls real-time situational awareness, personal safety solutions and the optimisation of work flow all into one. — Our comprehensive system offers new opportunities for countries like Finland and Germany, where healthcare costs need to be cut in the near future by up to 20 per cent in order to maintain the present level of service, says Herrala. Some 70 per cent of the company’s turnover consists of exports. In addition to Finland, its key market areas are Sweden, Germany, the UK, Saudi-Arabia and Australia. This year’s growth figures equal some 500—700 per cent. The company’s goal, according to Herrala, is to maintain the same momentum next year also. Elsi Technologies’ smart floor solution has been installed in around 2000 flats in Finland and overseas. The majority of the locations are care facilities but the floor can also be installed in private homes. As the population ages, exports are growing strongly in the Nordic countries. — The smart floor uses sensor technology to identify the location and movements of people along the floor. The user interface has been developed in co-operation with customers, which means that it is as user-friendly as possible, explains Sales and Customer Care Specialist Ailukka Hovi. The smart floor sends data concerning the movements of residents directly to the nurse’s mobile. — The strong points of the system are automatic alarms and customisation, such as the possibility to adjust the sensitivity of the man-down alarm. The system also provides precise information concerning changes in the daily routines of the resident and assists in diagnosing illnesses. Elsi’s technology encompasses the entire flat and does not limit its interior design. The smart floor is an invisible helper that doesn’t put a label on the user, says Hovi. A AICEP lança um novo produto de conhecimento dirigido às empresas portuguesas sob o título HORIZONTE INTERNACIONALIZAR – GUIA PARA PME. Pretende-se concretamente com este produto aliar informação útil sobre as várias dimensões do processo de exportação/internacionalização e as experiências individuais das empresas. Para o efeito, apontam-se pistas de diagnóstico de oportunidades e de modos de desenvolvimento da sua ativi­dade no exterior, 19 estudos de caso de empresas com compromissos internacionais e setores de atividade distintos e, ainda, 8 testemunhos de CEO sobre as suas perspetivas do processo. A AICEP espera que este trabalho venha a constituir mais que uma ferramenta de trabalho, sobretudo para quem lida diariamente com os nossos clientes, uma verdadeira fonte de inspiração. Irá ter lugar nos dias 28 e 29 e Novembro, uma missão de empresas europeias a Lisboa, liderada pelo Vice Presidente da Comissão Europeia, António Tajani, no âmbito da iniciativa “ EUROPE 2020 Strategy for Growth”. Esta Missão tem como objectivo dar a conhecer às empresas europeias as oportunidades de negócios que Portugal tem para oferecer, através da realização de uma Conferência sob o tema “Promoting Business Partnerships in Portugal”, no dia 28 de Novembro, da parte da tarde, e de Encontros Bilaterais que decorrerão no dia 29 de Novembro, durante todo o dia, de forma a permitir um contacto direto entre as empresas europeias e os potenciais parceiros portugueses. Considera-se ser uma excelente ocasião para as empresas portuguesas alargarem o seu universo de conhecimento e de contactos, com possibilidades de novas oportunidades, associadas ao desenvolvimento de parcerias internacionais, que contribuam para, ou consolidem, a internacionalização dos seus negócios. A economia do mar, a indústria farmacêutica e da biotecnologia, o sector do turismo, os componentes para a indústria automóvel e aeronáutica, as tecnologias de informação e comunicação, a agricultura e a indústria agro-alimentar, a indústria do papel e os serviços partilhados, serão os sectores mais tratados na conferência. O IAPMEI, enquanto coordenador da Rede Enterprise Europe Network em Portugal, está a organizar em colaboração com a Comissão Europeia e a com a aicep Portugal Global, os Encontros Bilaterais que terão lugar no dia 29 de Novembro, com o já mencionado objectivo de dinamizar oportunidades de negócio entre empresas portuguesas e europeias. Para esclarecimentos adicionais contacte o seu gestor de cliente na AICEP. – A segunda inscrição para os Encontros Bilaterais que, num primeiro momento, passará por registar o perfil da Vossa empresa (tecnológico, comercial, de produção ou outro), tanto ao nível da oferta, através da seguinte plataforma: http://www.b2match.eu/m4g-portugal. Para os Encontros Bilaterais as empresas terão de se inscrever até 30 de Outubro, para que, entre 8 e 18 de Novembro, possam seleccionar (on-line) os encontros com as empresas europeias. Almoço-Debate: Design failures of the Eurozone. Can they be fixed? 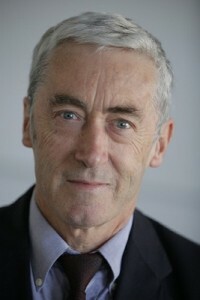 Temos a honra de receber o Senhor Paul De Grauwe, Professor na London School of Economics, que nos irá falar sobre o tema “Design failures of the Eurozone. Can they be fixed?”. Participam também neste almoço membros da Câmaras de Comércio Luso Sul-Africana, Luso-Italiana e Portugal-Holanda. Será um prazer tê-lo entre os presentes nesta iniciativa, durante a qual o nosso convidado de honra irá discursar sobre um tema em destaque na actualidade, sendo esta uma ocasião perfeita para reforçar a rede de contactos pessoais e de negócios. Agradecemos que façam a vossa inscrição acompanhada do respectivo pagamento até ao dia 30 de Outubro a fim de poderem garantir a vossa participação. A inscrição é feita pelo envio da ficha de inscrição abaixo. A apresentação será feita em inglês. emitido à ordem da CCLF. Ou transferência bancária em: ………/………./……….. para a conta NIB 0010 0000 76815220001 44 Banco BPI. NB: As pessoas inscritas, que por qualquer motivo não possam assistir ao almoço, devem confirmar a sua desistência à CCLF com pelo menos 48 horas de antecedência. Caso contrário, teremos de cobrar o valor da inscrição. 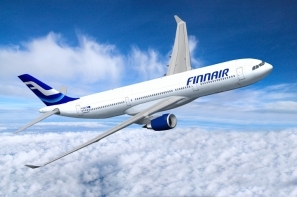 Finnair has been named Best European Airline at the 24th annual TTG Travel Awards, an annual event organized by the Asia-Pacific travel industry. Punctuality, service quality and hassle-free transfers were all factors in favour of Finnair being given the honour by readers of the publications TTG Asia, TTG China, TTG India, TTGmice, TTG-BTmice China and TTG Asia Luxury. — This year we are in the midst of a series of upgrades to the customer experience, and it’s gratifying to see efforts already start to pay off as we seek ways to make the experience of flying to Europe from Asia even better, said Finnair Chief Commercial Officer Allister Paterson. Finnair is specialised in traffic between Asia and Europe, serving 13 cities in Asia and more than 60 European destinations via its Helsinki hub. The only carrier in Northern Europe with a 4-star Skytrax rating, Finnair also routinely ranks high in global punctuality surveys. As the airline approaches its 90th birthday on November 1, Finnair is also in the midst of an upgrade drive from lounge service and food to cabin interiors and seats. GTI The Global Dynamism Index ranks countries by their performance in five key areas such as science & technology. Finland has been ranked as the most dynamic country in Europe by the Grant Thornton Global Dynamism Index (GDI) 2013. Australia is named the most dynamic country in the world followed by Chile, China and New Zealand. Finland holds the joint fifth place with Canada. Australia climbed to the top from the seventh place in 2012, and China rose 17 places from last year. The other European countries amongst the top ten are Sweden and Norway. The GDI report notes that “despite the Nordic countries sliding, government policies there make it one of the best places in the world to grow a business.” Finland was last year ranked in the second place and Sweden in the third place. GDI shows increasing science & technology activity, which will help sustain economic growth potential by boosting the quality, productivity and efficiency of outputs, comments Ed Nusbaum, global CEO at Grant Thornton. The index includes 60 world’s largest economies, and the companies are ranked by 22 indicators such as gross domestic product (GDP) growth, research and development (R&D) spend, regulatory risk and access to finance and labour productivity. 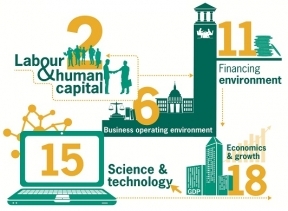 Rankings are based on performance in five key areas – business operating environment, economics & growth, science & technology, labour & human capital and the lending environment. – A segunda inscrição para os Encontros Bilaterais que, num primeiro momento, passará por registar o perfil da Vossa empresa (tecnológico, comercial, de produção ou outro), tanto ao nível da oferta, através da seguinte plataforma: http://www.b2match.eu/m4g-portugal .